To make this more manageable, the documents are grouped into sets of three or four per theme. Prompt questions are provided to help students address each theme. 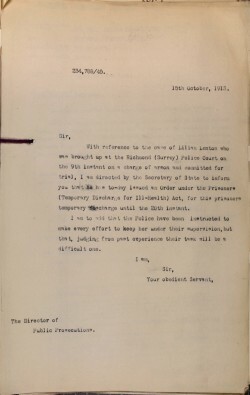 The documents are arranged on the webpage so that the first row of documents relate to police methods, then suffragette tactics, followed by sources relating to the government’s response. It is crucial that students appreciate that the same document can reflect more than one of these themes, so the final prompt question for each is included to encourage them to do this. Again, this is should not become an exercise in just finding ‘examples’ of the themes. Students should be encouraged to go on to interpret this evidence, pick up any inferences or see if they can detect any unwitting testimony. Some general guidance questions on how to evaluate and understand documents are included here, to help students to draw their own conclusions and inferences from the documents. (Teachers may wish to print these out, and discuss them with the students before they look at the sources). All documents are provided with transcripts. What type of document is it? (e.g. letter, report or newspaper). Teachers may want to break their class up into groups and get students to feed back on the different sets documents and/or annotate them at the white board. They may wish to hold a class debate on the case for/against the different tactics used by suffragettes or debate police/authorities responses’ to the campaign. Finally, teachers may wish to extend their student focus on the suffragettes by using the second resource on the movement, a collection of themed documents on a particular suffragette protest at Kew Gardens in 1913. Again teachers may wish to introduce pupils to these documents to create a wider enquiry question of their own. 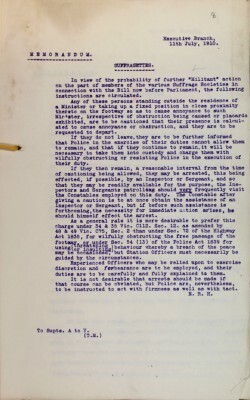 Study the documents covering each theme: police methods; suffragette tactics; government response to the movement and answer the questions for each group of documents. What evidence can the top row of documents provide about the police methods used to deal with the Suffragettes? 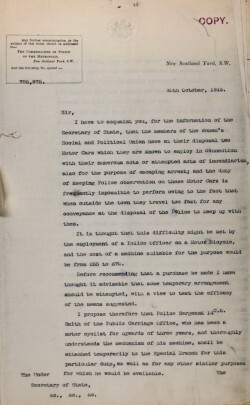 How did the police gather information about suffragette activities? What does it suggest about police organisation? What does it suggest about attitudes to suffragette activities? Can we learn anything from this set of documents about methods used by the suffragettes to further their cause? 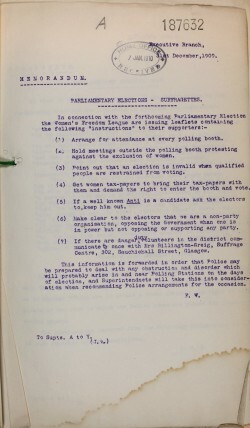 What evidence do the second row of documents provide about suffragette tactics used in the fight for the vote? What different types protest did suffragettes carry out? Do they reflect a particular type of approach? What does it suggest about suffragette organisation? 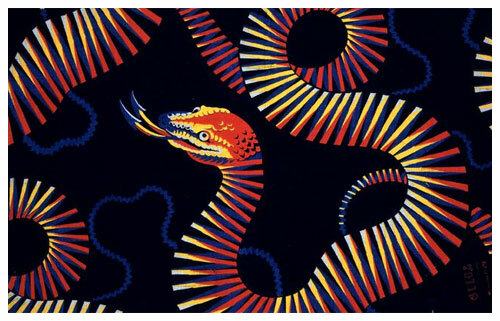 Can we learn anything from this set of documents about methods used by the Police? 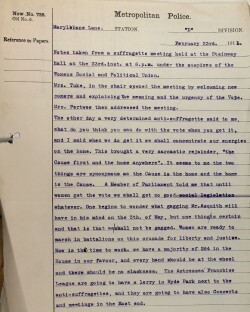 What evidence do these final three documents provide about the government response to the Suffragettes? What was the point of the Prisoner Temporary Discharge for Ill-Health Act? 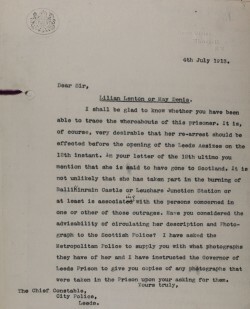 What do the documents suggest about the attitude of the authorities towards the suffragettes? 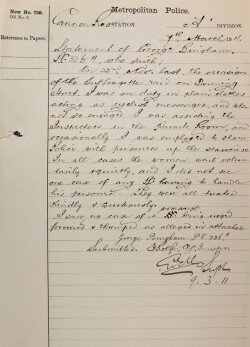 Can we learn anything from this set of documents about methods used by the suffragettes? Today, every British citizen from the age of 18 has the right to vote and so have a say in their government. This right was not easily achieved. In the 19th century, campaigners fought to extend the vote to working class men in 1867 and 1884. However, there was still much opposition to women getting the vote at the time. Without the vote it meant that Victorian women had very few rights and it represented their inequality with men in the law. For example, until 1882 a woman’s property often went to her husband on their marriage. The Women’s Social and Political Union, founded by Emmeline Pankhurst and her daughter Christabel in 1903, used more militant tactics. 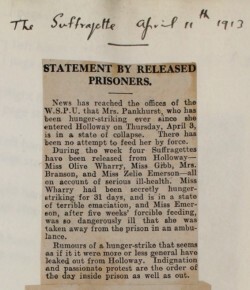 Many suffragettes went to prison as a result of their actions and, while in prison, they often went on hunger strike to gain publicity for the cause and as a result were forcibly fed. In 1913 the Prisoners Temporary Discharge for Ill-Health Act was passed in Parliament, often referred to as the Cat and Mouse Act. According to this, any hunger-striking woman prisoner was released when they became seriously ill, and re-arrested when recovered. With the coming of the First World War the NUWSS and WSPU called off the women’s suffrage campaign. 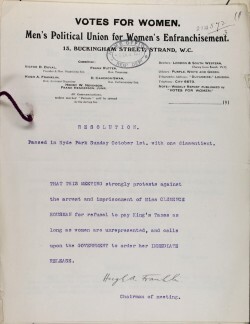 Afterwards, in 1918, women were given limited voting rights with the Representation of the People Act. Universal suffrage, that is, the vote for men and women on equal terms, was finally achieved with the Equal Franchise Act in 1928 when all men and women were given the vote at 21 years. In 1969 the voting age for men and women was lowered to 18.